Here are some important things that I’ve been meaning to tell you, none of which merits a post of their own. 1. My son has two loose teeth. I call them “Wigglies” and he calls them “Wigglers”. I told him that I will never call them Wigglers because Wigglies is the proper scientific term. He is thisclose to buying it, so play along, ok? 2. My daughter made a list of baby names that she is considering for her children of the future. I hope that it doesn’t violate any kid konfidentiality to tell you that “Donna” and “Pandora” are on the “DEFINITELY NOT!!! !” list. Also, for some reason she has approximately fifty girl names and six boy names selected, so I am assuming that she is planning on being her generation’s Mrs. Duggar. Dabbling in eugenics. 3. I lovingly hinted to Husbandrinka that he should get a haircut and he said, “that’s all that I have planned for the weekend!” Which sounds great, except it’s our anniversary. He forgot! I just love when we’re all American like that! 4. I am reading Are You There, Vodka? It’s Me Chelsea! 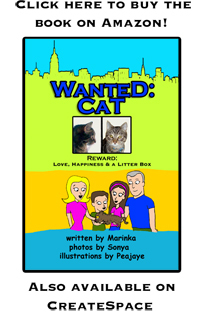 which is very, very funny and a quick read. I recommend it. 5. I have Raging PMS. Which means that I am available to itemize your personality flaws for you, completely free of charge. 6. If I get another email from the Obama campaign, I may have a nervous breakdown. I realize that the election is entirely in my hands, but calm down already. 7. Oh, yeah, because some people asked. 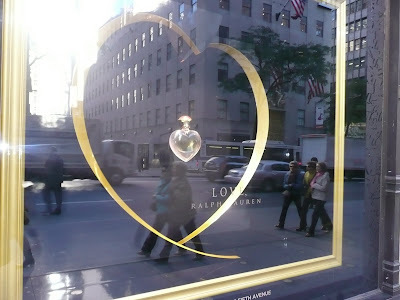 This is the picture of the Ralph Lauren perfume bottle in the Saks window display. They had four windows of this. I don’t get it. 8. Two blogs that I love went offline this week. I’m trying not to take it personally. 10. I have nothing interesting more to say! I tried to upload a photo of a mushroom to avoid this confession, but Blogger was taking too long and I gave up. So now I’m boring and impatient! Get to know me! fantastic :)your daughter might also plan on giving each child multiple hyphenated names, like Portia-Willow Sarah-Belinda Jenny-Felicia 🙂 yeah. even then, 50 is a lot. Interesting bottle. I wonder how it stands up and yes, you are right it is pointless. You’re so right about the weather comments! I’m guessing we’ll start hearing them this weekend if we get the predicted snow. It’s wigglers man…stick by your guns. Fight the power! I’m sure he’s just teasing about forgetting your anniversary. If he sees this comment, he may want to refer to number 5 on your list. Ok this is weird – I wrote my blog before reading yours this morning – I was obviously using my intuition with you as I also wrote about the emails from the Obama campaign and its my anniversary tomorrow. Summer isn’t over in California! Ingrid had a brilliant idea. If she used hyphens and middle names, it would reduce to a totally manageable twelve kids. Good luck Grandmarinka. I too have raging PMS, and I may have eaten a box of Samoa girl scout cookies in two days. If you love that Chelsea Handler book, I highly recommend her first one “A Horizontal Life,” I have never laughed so hard as I did when I read about the costume incident. You will love it!!! Thank you so much for mentioning the rainfall of Obama emails. I seriously thought I was the only one being bombarded. I can’t even locate my daily horoscope anymore. The complaining about the weather thing is so tedious. You can’t do anything about it, so why discuss? i seriously am at the point where, i would prefer a check for $3 rather than getting another mailing. at least that buys me a little coffee. and wiggly/er teeth. gross. i can’t handle wiggly/er teeth. I’m so with you and 4 and 5. I’m forcing myself to eat sugar snap peas cause if I scarf down any more salt or chocolate, I just may burst. And I LOVED Chelsea’s book. I’ll take a number 5, please. With a side of vodka for my RAGING PMS. I was SO giving all kinds of free consults today on people’s character flaws. I just don’t understand why I’m so underappreciated. It’s a selfless act of kindness, for the LOVE OF GOD!! I hate when people talk about the weather, especially when it’s me. And this “If I get another email from the Obama campaign, I may have a nervous breakdown. I realize that the election is entirely in my hands, but calm down already.” I agree completely. I can’t handle the pressure!! They are making me insane. #9? I didn’t shut down my blog. Wait. you weren’t talking about me, were you? #4 I want to read that book. What a clever title! #5 I would ask for an analysis, but I think I’m scared.